Cathay Pacific cabin crew Christine Wang and Winnie Phan with James Ginns, Regional General Manager Europe, Cathay Pacific, and Vincent Harrison, Managing Director, Dublin Airport. Expats and tourists travelling between Australia and Ireland are now spoiled for choice as competition ramps up on the lucrative route. Cathay Pacific is the latest carrier to offer direct flights from Asia into Dublin, joining Etihad, Emirates and Qatar in an increasingly crowded market. 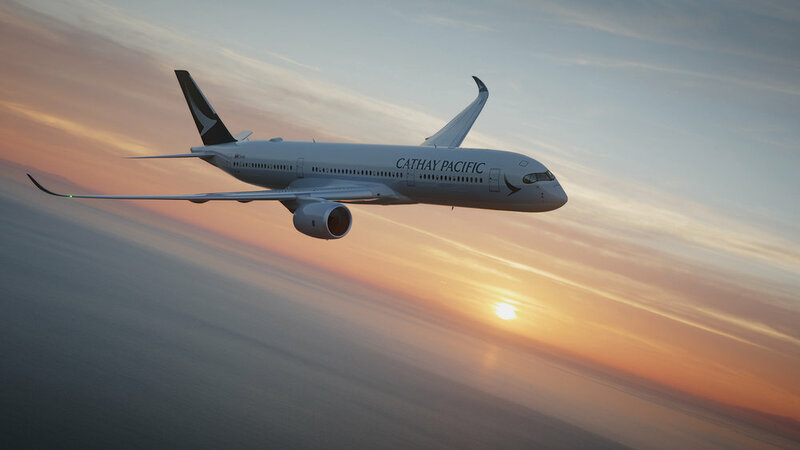 Cathay Pacific flies to Dublin four times a week on the state-of-the-art A350 aircraft and the new route has been hailed as a great success by the airline and tourism chiefs. Tourism chiefs in Ireland have also hailed the route as “a game changer”. Tourism Ireland CEO Niall Gibbons said: “China is the largest outbound travel market in the world and one that Tourism Ireland is committed to growing over the coming years. In 2017, we welcomed an estimated 70,000 Chinese visitors to the island of Ireland; the introduction of the new direct flight from Hong Kong is a major game-changer and offers a real opportunity for us to build on this number. The Airbus A350-900 flies the 12 and half hour route between Dublin and Hong Kong. In the Irish summer months, the flight departs Dublin at 11.55am, arriving in Hong Kong at 07.05am. The return flight departs Hong Kong at 12.50am, arriving in Dublin at 06.45am. In the Irish winter months, the flight will depart Dublin at 11am, arriving in Hong Kong at 7.30am. The return flight will depart Hong Kong at 12.15am and arrive in Dublin at 05.30am. Connection options to and from Australia are considerable with direct flights to Brisbane, Perth, Melbourne and Sydney. A brief stopover in Hong Kong can mean a ‘door-to-door’ travel time of less than 23 hours from Dublin to Sydney when travelling east. The Airbus A350-900, which services the Dublin-Hong Kong route, carries a total of 280 passengers , 38 in business class, 28 in premium economy and 214 in economy. Cathay Pacific crew at Dublin Airport. The business class service features state-of-the-art seats which adapt to your preference in-flight and include two pre-set settings for sitting and sleeping with additional controls for smaller adjustments. The fully flat bed is extremely comfortable and the friendly cabin crew are sensitive to not disturbing you unless absolutely necessary. The in-flight food is excellent with a variety of tasty options for each meal, all served with fine wines and a selection of spirits and beers. Business class passengers can enjoy a wide selection of movies, TV shows, music and games on their own generously-proportioned touchscreen TV and top quality headphones. In-flight wi-fi is also available and passengers can pre-download an app for their tablet or smartphone to access the internet in the air. According to Australia-based Irish specialist travel agents, the Cathay Pacific Hong Kong-Dublin route is proving very popular with expats and tourists alike. The writer travelled at his own expense but received an upgrade to business class courtesy of Cathay Pacific.